Cypress Truck Accident Injury Lawyers – Dependable, Responsible and Experienced Attorneys With More Than 40 Years of Litigation Expertise! 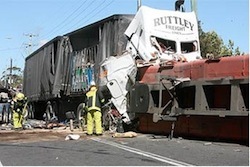 Seeking a Truck Accident Injury Lawyer in Cypress, Orange County, California? Huge trucks or semi-trucks traveling at high speed in Cypress, California can result in a devastating crash or accident with brutal injuries or even fatalities resulting in a wrongful death accident claim. Truck drivers are often negligent, inattentive or rash in their truck handling and driving, causing truck vs truck or truck vs car collisions. This neglectful behavior has been proven catastrophic for the car and other small vehicle passengers, especially motorcycle drivers. If you or a loved one had a tragic truck accident in Cypress, Orange or any other place in California, because of the negligence of a truck driver, contact experienced truck accident personal injury lawyers. Our experienced lawyers are proficient in personal injury claims, truck accident injury claims, and wrongful death claims. We offer personal injury legal services for those injured in truck, tractor-trailer, automobile, motorcycle and other accidents, and to the relatives and families of those killed in truck accidents for wrong death claims in Cypress, Orange County, California. We are experienced personal injury and truck accident injury attorneys who work on a contingency fee towards preserving your rights and to obtain maximum compensation for your physical damages, as well as for emotional and financial losses. Please visit our Truck Injury Accident Web Site to learn more about the truck accident injury claims process and contact us now for a FREE case consultation and evaluation about your specific Cypress truck accident or any other personal injury claim. About Cypress, Orange County, Calif.
Cypress is a suburban city located in the northern region of Orange County within Southern California. According to the 2010 U.S. Census, the population of Cypress was approximately 47,802. The population density was 6,991.1 inhabitants per square mile. Cypress is bordered by La Palma, Lakewood, Garden Grove, Anaheim, Hawaiian Gardens, Long Beach and Los Alamitos. Our experienced truck accident personal injury lawyers and law firm possess tremendous experience in resolving personal injury claims and wrongful death cases in Cypress, Orange County, Garden Grove, Anaheim, Los Angeles, the San Fernando Valley, Ventura, Riverside, San Bernardino and throughout California. To learn more about how we can assist you further with your truck accident claim or other personal injury accident claim in Cypress or anywhere in California, and what you need to do to protect your rights and to comply with special time deadlines and other procedural rules, please call us at 1-866-INJURY 2 or 866-465-8792 or 818-222-3400 (after hours, please dial 1 for immediate assistance) for a FREE, no-obligation consultation. Moreover, you can simply email us at info@WalchLaw.com, or just fill our easy contact form and find out what your options are and what you need to do to protect your rights and financial interests. On Accident Cases: FREE Consultation & Case Evaluation and NO Fee Until You WIN!